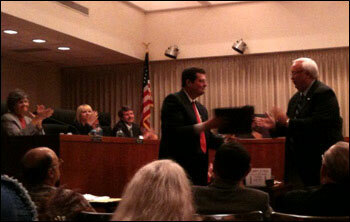 Rice Rose Law was presented with the Commercial Beautification Award for January 2010 at the Daytona Beach City Commission meeting held on January 20th, 2010. In presenting the award to Jim Rose, Mayor Glenn Ritchie detailed the beautiful landscaping around the Rice Rose Office building. There are a litany of different plants that were identified by the beautification representative and the Mayor spoke at length about them.